Do you collaborate on documents with your coworkers? Find it hard to keep track of who changed what when? I know that pain. I share files with coworkers and outside vendors and often collaborate on files. But keeping track of the latest changes to important documents in real time is difficult. I have to manually check my files and see which ones were updated. But, life just got easier. SecuriSync now has a Client Notification System! SecuriSync helps keep your files up to date and secure. 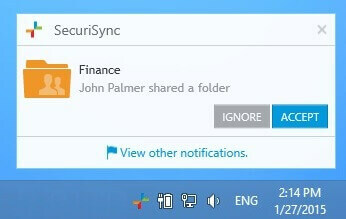 And now with SecuriSync’s new Client Notification System, you automatically get notified any time a file is updated. Each event from a subscribed folder pops up on your desktop. You get notified when others update or add new files to your subscribed folders — including shared folders and document updates. 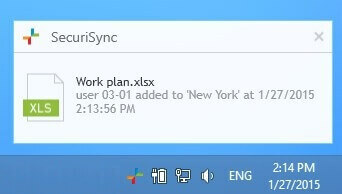 I am really excited about this new, powerful collaboration feature that is now available with SecuriSync. 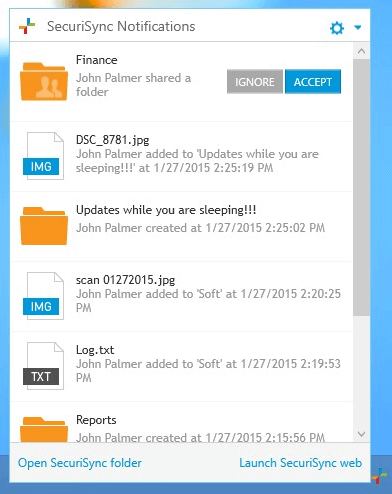 I know that once you try it, you’ll see how much easier it is to manage shared documents. Want to learn more about SecuriSync’s full feature set? Watch the videos on our SecuriSync website. SecuriSync makes file collaboration and security a breeze for Peloton. Find out how.